Please join us for a lecture by Radcliffe Visiting Scholar Fredrik Thomasson entitled Sweden and Haiti, 1791-1825. Register here to attend. Haitian historiography is evolving rapidly and the recent focus on the revolution has expanded to cover the first decades of the independent nation/s. New research has refuted the notion of Haitian post-independence isolation. Uppsala University historian Fredrik Thomasson contextualizes these perspectives in a discussion of Swedish-Haitian relations from the beginning of the rebellions in the early 1790s to the Swedish recognition of Haiti in 1825. Thomasson will compare the reporting in Sweden to that in the Swedish Caribbean colony Saint Barthélemy where the Revolution was seen in a very different light. The Swedish case is an interesting testimony both to the extent that the revolution was world news and how newly independent Haiti interacted with surrounding colonies, as well as with a distant Scandinavian nation. Lite refreshments will be served. Register at http://bit.ly/FThomasson to attend. When Sweden sold the Caribbean island Saint Barthélemy to France in 1878, all governmental archives were left on the island. This collection is now held in the French colonial archives in Aix-en-Provence: Archives nationales d’outre-mer. Fonds Suédois de Saint Barthélemy (FSB) – with documents in mainly Swedish, French and English. It covers the entire Swedish period 1785–1878 and is by far the richest source on Swedish Caribbean colonialism. The archive, c. 300.000 pages, is several times bigger than the material on the Caribbean possession in archives in Sweden but has, with very few exceptions, never been used by Swedish historians. This presentation discusses the digitization project of the FSB and gives an account for the archive’s exceptional history. Negotiations with institutional stakeholders and contact with a larger public confirms that this project is very much part of contemporary history and memory debates. Why was the archive never used, and why was there so little interest from Swedish archival institutions to make it accessible? Other issues to be discussed are the effects of digitization on colonial history, and to what extent access to this archive can change perceptions on Swedish Caribbean colonial history. Interested in attending? Register as soon as possible at the bit.ly link above. Seats for our lunches tend to fill quickly, so do register early. We will let you know if you receive a seat. This entry was posted in Conferences and Lectures, Events, Haiti, Slavery and tagged colonial archives, Haiti, Haitian Revolution, slavery, St. Barthelemy, Sweden, Swedish colonialism on January 16, 2019 by mghachem. Looking forward to speaking on November 7 about “The Jesuits, the Souls of Slaves, and the Struggle for Haiti, 1720-1725” at Harvard’s Mahindra 18th c. Studies Seminar. Details here. This entry was posted in Conferences and Lectures, Events, Haiti, Slavery and tagged Haiti, Jesuits, Saint-Domingue, slavery, Society of Jesus on October 17, 2018 by mghachem. This entry was posted in Conferences and Lectures, Events, Haiti, Slavery and tagged Africa, African history, Joseph Miller, slavery on September 28, 2018 by mghachem. This entry was posted in Conferences and Lectures, Haiti, Slavery and tagged archives, French Atlantic, Haiti, Moreau de Saint-Méry on May 18, 2018 by mghachem. A couple of weeks ago I had the privilege to participate in one of the most interesting and important dialogues I have been involved in as a historian. The occasion was the second of a series of forums on the “MIT and Slavery” project, an investigation of MIT’s relationship to slavery that MIT’s President Rafael Reif commissioned at the end of last academic year. The project has been spearheaded by my colleague Craig Wilder, who had the brilliant idea of creating an undergraduate research seminar (along with MIT archivist Nora Murphy) to undertake the investigation. The first forum in the series featured Craig and Nora as well as T.A. Claire Kim and a genuinely spectacular cohort of undergrads, who spoke on that day with a composure and degree of insight one would expect to see from an advanced historian (video here). The second forum, in which I was joined by Craig and MIT SHASS Dean Melissa Nobles as well as historians Tanalís Padilla and Lerna Ekmekçioğlu, was a follow-up response to questions from the MIT community about the purpose of studying this chapter of MIT’s past. The panel opened up onto a broader discussion of “the power of historical knowledge to make a better world,” from which I learned a great deal (not least by way of the lively Q&A with the audience that followed). A video recording of the event can be found here, and a news summary here. The event was organized by Emily Hiestand of the MIT SHASS Dean’s office. This entry was posted in Conferences and Lectures, Events, Haiti, Slavery, Teaching and tagged history, MIT, slavery on May 17, 2018 by mghachem. 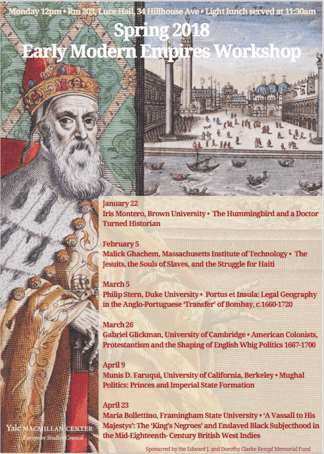 Looking forward to visiting Yale’s Early Modern Empires Workshop Feb. 5 for discussion of “‘Our Crown and Glory’: The Jesuits, the Souls of Slaves, and the Struggle for Haiti” — the penultimate chapter of my book on the revolt against the Indies Company in Haiti, 1720-1725. This entry was posted in Conferences and Lectures, Events, Haiti and tagged Haiti, Jesuits, Saint-Domingue, slavery on January 25, 2018 by mghachem.